The note, handwritten in German language, was sold at auction in Jerusalem, Israel, in October 2017 for 1.56 million, US dollars. According to Theosophy, however, Einstein’s idea in itself is worth much more than that sum, and yet, it cannot be sold, or bought. Its value is above the uncertain laws of marketing. The axiom belongs to the wisdom of all time. Worded in various ways by different religions and philosophies, the idea, well expressed by Einstein, is freely available to every human being of good sense. 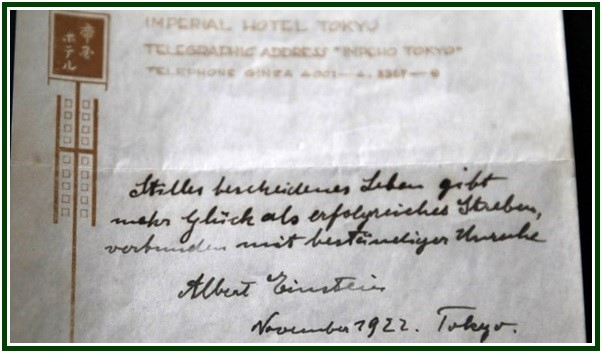 The lesson recorded by Einstein in his 1922 note belongs to Eastern and Western scriptures alike. It is central to Chinese Taoism. It is taught in classical Stoicism, being prominent in the writings of Marcus Aurelius, Musonius Rufus, Epictetus and Lucius Seneca. It has been adopted by Christian mystics. The principle of abstinence is of decisive importance in the Yoga of Patanjali. It is one of the main topics in the classical book “The Duties of the Heart”, by the Jewish sage Bahya ibn Paquda. True, millions of people prefer to ignore such a fundamental view of happiness. And this is because they lack a deeper sense of self-esteem. One must know first-hand the value of his own life, before one is able to strive for the best and to live up to the moral precepts of universal wisdom. A feeling of self-respect leads to firm, moderate action. The approval of our own conscience allows us to practice self-restraint; and voluntary simplicity paves the way to mutual help. A modest attitude before life makes a solidarity possible whose result is lasting peace. “The Dhammapada”, with explanatory notes and a short essay on Buddha’s Thought, The Theosophy Company, Los Angeles, California, 1955, 139 pages. See chapter eight, p. 23. “Ethics from Sinai”, an eclectic, wide-ranging commentary on Pirke Avoth, by Irving M. Bunim, 3-volume edition, Philipp Feldheim, Inc., New York, copyright 1964, see volume II, Perek IV, Mishnah 1, p. 3. “Ethics from Sinai”, by Irving M. Bunim, Philipp Feldheim, Inc., New York, vol. II, p. 8. Proverbs, 19:16. “Tanakh, The Holy Scriptures”, The Jewish Publication Society, Philadelphia, Jerusalem, copyright 1985, 1624 pp., see pages 1315-1316. See more on Einstein’s note about happiness. An initial version of the above article was published at “The Aquarian Theosophist”, March 2019, p. 16, under the title of “Albert Einstein, on a Quiet Life”. It had no indication as to the name of the author. “Einstein’s Theory of Happiness” was published as an independent article in our associated websites on 09 March 2019. It is also available at our blog in “The Times of Israel”. You are invited to read the articles “The Theosophy of Albert Einstein” and “E. Galois and A. Einstein”.